This is a very versatile tart in that you can substitute the fruit for a seasonal option of your choosing. In the book, plums were selected for their beautiful color especially in contrast to the blond/brown color of the almond cream. I could also see this with apricots, peaches or nectarines all of which are in season now and pair well with the almond flavor. This week, Pastry Chef Sebastian Rouxel, co-author of the Bouchon Bakery cookbook happened to make this tart as well. How timely! So I was excited to make this week's tart because I had just been to the farmers market and saw the plethora of plums available. It was difficult to choose from the many different varieties, but after many samples, I stuck with the tart Santa Rosa plums that the book calls for. This tart was actually one of the easiest ones so far. There are only three components: pate sucrée, almond cream, and plums. The crust isn't even blind baked, just rolled out, filled with almond cream, and arranged with plums on top. The almond cream I made the night before, fairly easy, no cooking involved. The plums gave me a bit of a problem. I had a hard time cutting them, removing the pits and slicing them into uniform pieces. The fruit was so juicy and slippery that it was difficult to slice. The slices were also difficult to place in a spiral pattern because they were so slippery, but I did my best. After the allotted 45 minutes baking time, the tart was done. It smelled amazing, and although it didn't look as pretty as the book, it tasted great. The sweet crust and almond filling are a good balance to the tart plums. I did notice that after sitting overnight, the tart got very soft. I wasn't able to slice it cleanly, since the crust had softened up quite a bit from the juices of the plums. Overall, a very easy and satisfying tart. The book suggests you use any fruit, peaches or apples or whatever is in season, and that's a great idea. Maybe sour cherries? Yum! I made a lot of the pate sucre to practice before making the tart. I used one portion for a quarter sheet pan size for my first plum tart practice. For the second batch I made 10 individual 4.5" tarts in shells for a dinner party. Rolling between two layers of plastic wrap was ideal for maintaing the balance of ingredients without drying it out with additional flour. The almond cream filling was really simple and delicious but I added the portion of pastry cream to make it frangipane (I just like it more.) However Bouchon's frangipane has a higher moisture overall that what I expected - next time I will try using just the almond cream. 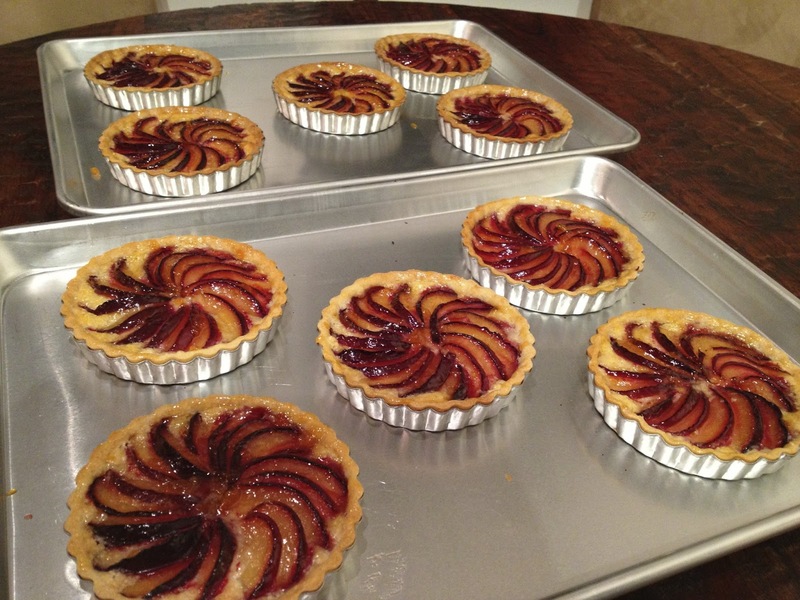 I also put apricot glaze over the tarts as soon as they came out of the oven. This helps make them a little shiny as well as seal the moisture and fruit. All in all this is a very simple item to make but I like that much of it requires skill to perfect. Working with the pate sucre in 10 individual tarts was trying at first, but rotating dough in and out of the refrigerator as I worked helped make it much more manageable - and easier to handle. Now that I found a couple of the 8" professional steel rings, I will make apricot tarts this week with the remainder of the pate sucre. I was really excited to make this one. It did not disappoint. I only had an 11 inch tart pan. So I used the large batch of pastry cream and I'm glad I did because it's pretty tasty. Although, truth be told, I added extra 1/4c con sugar. But because I used so much pastry cream it bubbled up through the fruit. I used A LOT of plums, but when the cream came through the fruit I was scared I hadn't used enough plums. But there was still sooo much tart plum that it balanced well. The recipe was extremely easy to make. The almond pastry cream was super simple. I already had pate sucree. So it was easy to make in no time. I ate it piping hot even though Thomas Keller said resist the urge. I couldn't. I think it would be soooooooo delicious with peaches. Because it was a larger tart than the book called for I had to bake for about 75 minutes. I can't wait for my husband to get home from work. This will be right up his alley.